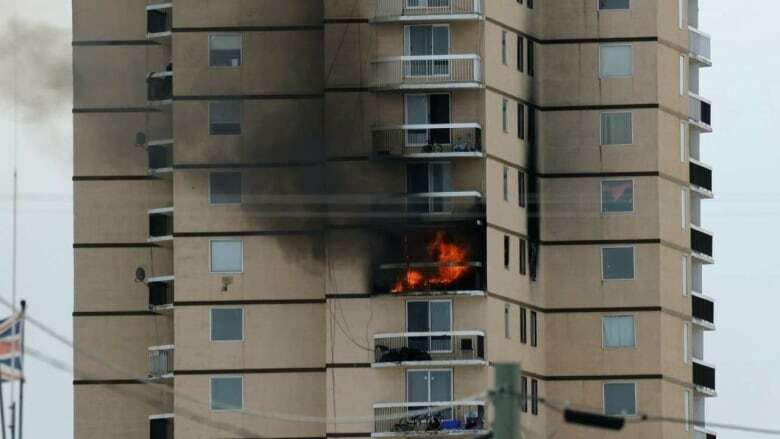 Smoke and flames could be seen billowing from a unit at Mackenzie Place, also known to locals as the 'highrise,' around 3 p.m. on Friday afternoon. 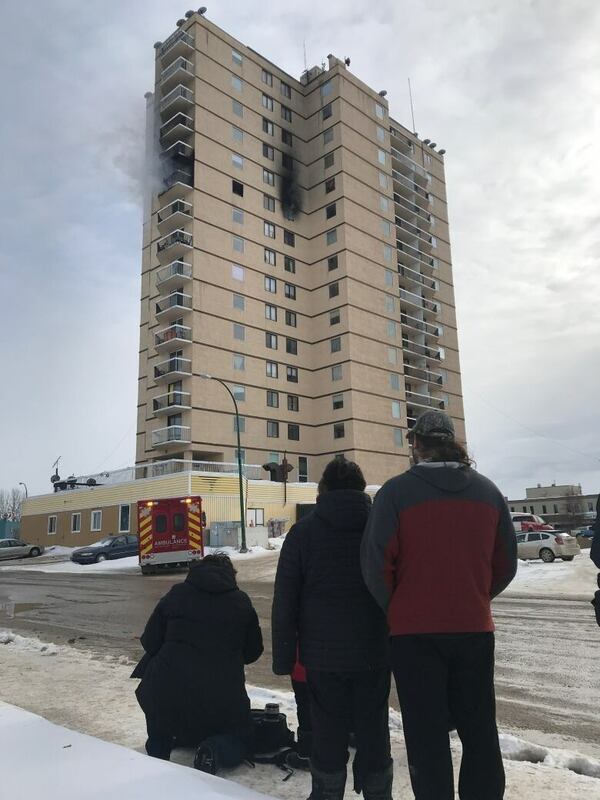 The fire at the Hay River highrise has been put out, according to mayor Kandis Jameson. The town is asking anyone who has evacuated from the building to register at the recreation centre whether or not they need accommodations. "Let us know that you're out there, where you are, how to get ahold of you, and register with us so we can meet your needs," said Jameson. She said none of the tenants will be let into the building tonight. There are gas and electrical inspectors on site, and the assistant fire marshal was heading to the building. She said right now, temporary accommodations have been made for those affected by the fire, and they are working on a back up plan in case people aren't allowed in the building for an extended period of time. The pharmacy will be open late to accommodate those who need medication or other essentials, such as diapers. Jameson said no one was seriously injured in the fire, although some people were taken to the hospital to be treated for smoke inhalation. 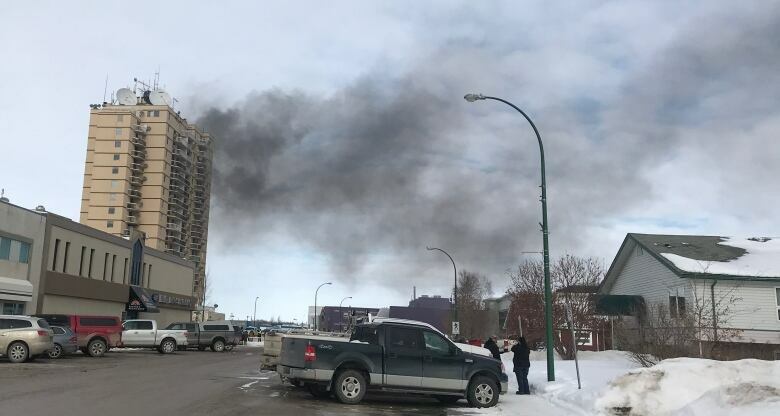 Smoke and flames could be seen billowing from a unit at Mackenzie Place, known to locals in Hay River, N.W.T., as "the highrise," on Friday afternoon around 3 p.m. The fire appeared to be on the 11th floor of the 17-storey building. Police and firefighters were on the scene, and it appeared the building was evacuated. The town's Facebook page posted that the recreation centre has been set up for residents of the building, and buses will be transporting evacuees. It will also be identifying clothing and other needs. Glenn Bugghins lives alone on the 9th floor of the building. A friend called him to tell him about the fire and he came "racing back" home. He said it's not clear if his unit is affected. "I hope not," he said. "I feel kind of scared to go back to the apartment now." He said previous safety issues at the building have always been a worry for him. "I just want everyone to be safe, that's all." About 150 people live in the building, which is owned by Satdeo Inc. It's about 40 years old. While there's no indication at this time as to what caused the fire, the owner has had past building code issues. Harry Satdeo was fined $10,000 in 2017 for building code violations, including not upgrading "structurally unsafe" balconies and a broken fire alarm system. Cheryl Carriere, who lives on the same floor as the fire, says there are so many false alarms at the building that she didn't think much of it when the alarm went off. Then someone told her it was an actual fire. "I just ran, put my shoes on," she said. She grabbed her purse and phone. "The hallways were full of smoke ... just run downstairs," she recalled. Carriere said she was frightened, adding "it shook me up, for sure." She said she'll stay at her son's house tonight, if necessary. "We haven't heard when we can get back in the building," she said. A spokesperson for the Department of Municipal and Community Affairs (MACA) said it needs to learn the "full scope of the damage and the impact on residents" before it decides how to assist. "MACA is in the process of working with the town to determine their resource needs," said department representative Jay Boast in an email. "At this point the primary focus is on the safety of the residents and the responders." Hay River Mayor Kandis Jameson said firefighters had to leave an ongoing fire at the Hay River landfill in order to fight the highrise fire. The town called a local state of emergency on Sunday in order to get more resources to fight the fire, which had been burning underground for some time. Jameson said it's been "a crazy week." Firefighters from Fort Smith had arrived in the community to help with the landfill fire, and more were expected from Yellowknife. The Hay River animal shelter is accepting any pets that may have been impacted by the fire and have no where to stay.